9/24/04 We haven't fallen off the horizon.....yet, but have taken a week off at home to rest up for the upcoming trip. We worked on the boat for a week getting the water line repainted. I had raised the waterline before we left and didn't get the off white paint sanded down enough or maybe I didn't let the bottom paint dry long enough but in any case it came off in the first washing. As long as the boat was out of the water while bing shipped south I thought it a good time to repaint. I think it should hold better this time. We are in Pittsburgh this week end to visit our youngest daughter, Julie. Her dental school is a year round affair now that she is seeing patients and I don't expect she will have time to visit us after we head south. We hope to leave in another week or so. 10/6/04 Well, we're back. Actually we are really gone. Gone cruising that is. We left Oriental today and are in Beaufort, NC tonight at the town docks. Oriental, we have decided, is the hardest place to leave. Life there is just right and there really is no reason to go anywhere else. The people are nice, there are lots of boats and we really love it there. But we had to give Tom and Liz Lathrop's dock back eventually and that put's us here tonight. Tom and Liz were generous enough to let us use their home while they were away. Thanks guys!! Ken Brandon, one of the Oriental good guys, came by the boat but we must have missed him. You see, I know he came by because there was a dollar under my power cord next to the connection. I had to think about why there would be a dollar under the cord but I remember handing Ken a dollar at the Bean one morning to settle his morning coffee tab a few weeks ago. I had forgotten about the dollar but Ken had not. And that's how life works in Oriental!! The Neuse river was in it's usual bad mood but it's only 5 miles across. The trip to Beaufort was all downwind after we got in the canal and we are here hanging out with at least 7 mega yachts of 75 feet and up. I hope we don't have to pass these guys in the morning!! 10/7/04 We left Beaufort and spent the night in a small bay that the military dredged out for the troops to train in while assulting a moored ship. There were 4 boats there the night we stopped. 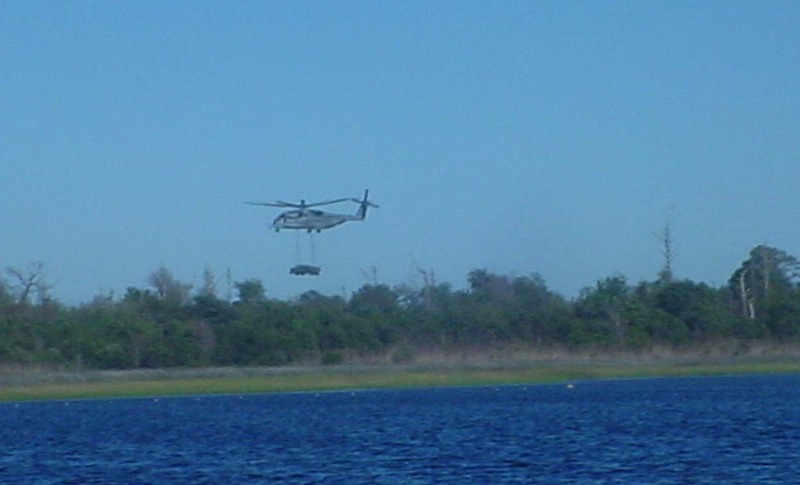 The US military owns a lot of property in coastal NC and they put on quite a show for us here. Pavelow helicopters spent the whole afternoon picking up hummvees and carrying them around the bay and dropping them back where they started, which was about 700 years from where we were anchored. After dark we had a couple of close flybys that we were hoping were a wee bit higher than our mast. The helos really pound the air into submission. 10/8/04 On to Wrightsville beach to meet up with our daughter, Jennifer. 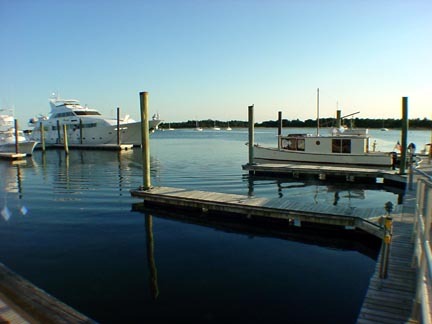 We will stay here for 2 nights at the Wrightsville Beach Marina. Nice place and close to everything. 10/11/04 We left Southport for South Carolina. We spent one night at the wildlife canal on the anchor and one night at Southport Marina. Not much fun at the marina as we had an end of the dock tie with exposure to the waterway and all the wakes from the fishing boats. There was a no wake zone here in years past but the Coast Gaurd doesn't seem to have their boats on the water as much as in the past to enforce it. Sandy Mitchell came by for his tour of our boat. He was showing me a picture book about the workings of the propulsion system on the ferry he drives for a living. Small fins point straight at the bottom and rotate to give it thrust. Neat system. 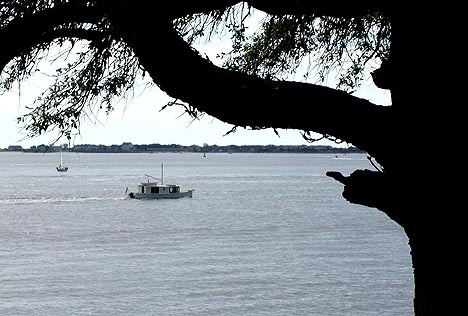 Check out the pictures Sandy took of our boat in the Cape Fear River off Southport as we came into town. One of the few I have while underway. The Army's version of a "drive in"